Halal ready meals are a growing consumer market for Muslims especially in Malaysia and global halal food market. Muslims must ensure that all foods (particularly processed foods), as well as non-food items like cosmetics and pharmaceuticals, are halal. Frequently, these products contain animal by-products or other ingredients that are not permissible for Muslims to eat or use on their bodies. Halal refers to what is permissible or lawful in traditional Islamic Law. 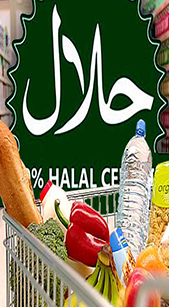 Halal Assurance Management System is a system developed by the company for 3rd party certification on products to show the status of the products as permissible to be consumed/used by Muslims consumers. JAKIM is the official competent authority in Malaysia to provide halal certification to the company after the company has successfully passed the site inspection. Each product, upon approval by the competent authority in Malaysia, may be marked with the halal certification mark of that authority provided the product complied to halal requirements. The Halal Assurance Management System is audited based on product compliance to Shariah Law, Halalan Toyibban Requirement - Food and Food Services, National Regulation, the system conformance to MS 1500:2009 Halal Food - Production, Preparation, Handling and Storage General Guidelines and MS 1900:2005 Quality Management Systems â€“ Requirements from Islamic Perspectives. This standard set the requirements for best halal practices for the manufacturers to produce high quality halal products. The standard gives specific guidelines parameters for electrical stunning on animals, slaughtering methods for chicken and cattle and more. For product deemed to comply with this standard, it shall comply with Clause 3 in processing as well as logistics in the halal food production e.g. storage, transportation, display, sale and servings of halal food, packaging, labelling and advertising, etc. This standard provides guidance on the implementation of HAS and it defines the halal assurance management system in documentation control, halal management and resources, halal product realization, monitoring and measurement of halal performance, analysis of data for HAS improvement. The company will required to have knowledge of HAS as a method to overcome hazards and establish a control system to ensure integrity and safety on the production for halal products and provision services. To provide guidance to develop and establish HAS within your operation. To assist client in developing the halal procedures in compliance with halal requirements. To identify and determine the halal critical point in the operation process and production. To conduct halal awareness program to make halal practice a culture among client personnel within the premise. To train halal personnel for halal internal audit in ensuring halal integrity system is being maintain at all times. To assist in halal 2nd party audit to verify supplier its halal ingredients and the halal production. To monitor the HAS implementation until achieved certification. To rectify and provide guidance to develop corrective actions to close out non-conformances from the halal audits.